Asia-Pacific: A Step Toward Historical Déjà Vu? The power structure forming in the region today has echoes of the past. The significantly improving relations between Beijing and Seoul in recent days not only imply a possible shift in the position of South Korea within the regional balance of power, but also reveal similarities between the Asia Pacific today and Europe in the 1930s. During that older era, there were five types of states on the European continent: A declining global power with interests in the region (Britain); a rising power unsatisfied with the status quo (Germany); regional power(s) preferring the status quo (France); regional powers sitting on the fence (Italy and the Soviet Union); and a group of small or relatively weak states (the newly independent countries in Eastern Europe). Among these states, some such as Romania and Bulgaria supported the rising power, and others such as Greece and Poland favored the status quo. Despite concerns over the balance of power on the European continent, London was unwilling to make a security commitment to any continental country, nor properly prepare for military intervention. Berlin gradually altered the existing order through a series of attempts at expansion. France, extremely sensitive to German threats, attempted to counter by allying with Britain and those European states which faced strategic pressure from Germany. Italy and the Soviet Union, after a waiting period, chose to cooperate somewhat with Berlin. The Eastern European states maintained defense ties with France, but did not systematically organize to balance Germany. Today, a roughly parallel structure has been formed in the Asia Pacific. There is the declining U.S. global power with a passive style of reacting to regional issues, despite its security commitment to its allies in the Asia Pacific and its military deployment. Unhappy with the status quo, and contending with a growing nationalism based on its ancient tribute system, China has a growing ability to change or challenge the status quo. Japan and India are attempting to preserve the status quo through individual military build-ups and bolstered security ties with ASEAN states. Russia and South Korea, after a brief waiting period, are this year flirting with closer ties with China. Among the relatively weak ASEAN states without an organized collective defense arrangement, those directly facing Chinese pressure, such as the Philippines and Vietnam, are working on an alliance and cooperation with other powers to balance this pressure. Others, such as Thailand and Malaysia, have taken a friendly attitude toward China. As a rising and discontent power, China shares two features with prewar Germany. First, Berlin and Beijing peacefully extended their territory by absorbing territory where the majority of the population share common ethnic features. After Hong Kong and Macau, China has made strong inroads into Taiwan. For example, a series of cross-strait agreements based on the Economic Cooperation Framework Agreement (ECFA) have come into effect, and a political agreement may be achieved in the near future. In addition, the biggest opposition party in Taiwan, the Democratic Progressive Party, has been very interested in ameliorating its problems with China by discussing the abandonment of Taiwan’s principle of independence. As long as this trend continues (barring effective external intervention), Taiwan could be like Austria in 1938, peacefully merging with China in the foreseeable future, regardless of whether that merger is de facto or de jure. Second, China poses territorial challenges to weak states more than it does to existing powers. Before the Second World War began, Berlin only directly challenged France and Britain by occupying the Rhineland, its other territorial expansions were toward Eastern Europe and Austria. To date, Beijing has only taken islands from ASEAN countries, and maintains a more aggressive stance toward Vietnam and the Philippines than it does toward Japan. Pointing out the similarities between the current situation and the one in the 1930s is not to say that China is bound to start a war. There are a number of differences. First, the U.S. is considerably better prepared militarily than the U.K. was in the 1930s, with forward deployments and decades of close security cooperation with regional states. In addition, before significantly reducing its reliance on foreign petroleum, whether through alternative energy or shale oil and gas, Beijing’s sea lines of communication (SLOCs) to oil producing countries, mainly in the Middle East, would be more vulnerable than were German energy supply lines to Hungary and Romania. Second, China faces a more complicated strategic situation than Germany did in the 1930s. The worst-case scenario for Germany was a two-front war, but both were land fronts with similar geographic conditions. China has at least three fronts: a maritime front against the U.S., Japan, and other Western Pacific countries, a mountainous front against India, and the plains it shares with Russia. Each front requires diverse military capabilities. Although China has many more material resources than the Nazi Germany, adequately distributing national resources on three major fronts would be arduous. These strategic constraints make Beijing less likely to use force to expand or secure its territorial claims. In terms of sovereignty and the international use of force, it is likely to expect the U.S. and other powers to stay out of low intensity conflicts involving paramilitary units such as a coast guard. However, the tragedy of the 1930 European experience demonstrates the lesson of perception. Hitler’s initial successes in expanding due to British and French appeasement inspired him to take more risks. China’s strategic moves, which are hard for other countries to counter, may give its decision makers the confidence to undertake further adventures, and to underestimate its strategic limitations. That confidence may be enhanced if it were to continue to improve its ties with Moscow and Seoul (admittedly, this is very far from certain). 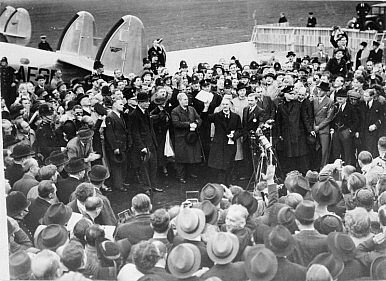 After all, the Second World War began only after Berlin secured an alliance with Rome and Moscow. With New South China Sea Tensions With Philippines, China Overplays Its HandWhat ARIA Will and Won’t Do for the US in AsiaDemocratic Ideas and Reality at 100: The Heartland of AsiaThe US and China Are Talking Again, But 'Competition' Is Set to ContinueWhat Does 'Competition' Between the United States and China Really Mean?